Coffee served with a smile. Cliché? In many coffee shops, yes. But at Biggby Coffee in Fort Mitchell, that slogan serves as the standard. 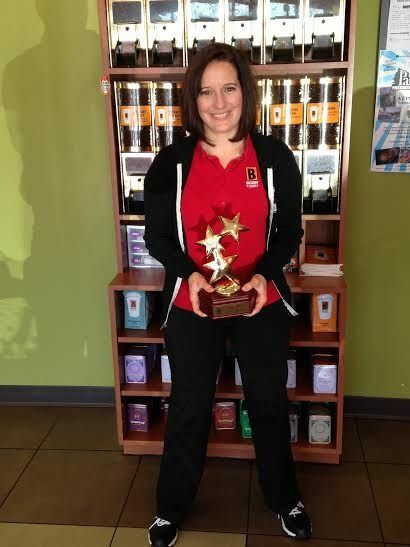 Recently selected as Store of the Year out of 195 Biggby locations, it is now the standard bearer for excellence. What makes this neighborhood shop different? Community involvement, franchisee Shanna Novosel said. “Anytime there’s anybody who needs anything, we’re always trying to be there for them. If it’s somebody raising money because they were diagnosed with cancer to a fundraiser for a local charity, to somebody who is having a 5K race, we always do everything we can to donate coffee,” she explained. Their success didn’t come overnight. Biggby faced a significant hurdle not long after its opening. “My staff…there were times I thought the store was going to have to close. We weren’t even a year old. They did awesome. If it wasn’t for them, Lily’s leadership and my staff, I don’t know if the store would still be here,” she said. “But, everything turned out ok. My daughter is thriving and my store is too, so I am very grateful for my staff and my customers with all their support. I had customers who would go run errands for the staff. I had customers who would come visit me in the hospital, they sent flowers, cards and they sent me emails and kept me abreast of things that were going on around here and in the community. If there was a fundraiser or a 5K around town, the customers would come and pick up the coffee for the donations. It is truly a testament to the community involvement that this amazing community that we’re in. I don’t know many other communities that would support a business like that. Successful businesses are the result of many important variables such as a friendly staff – and one that sticks around for a while. Fortunately for Biggby, it possesses each. “They really take pride in getting to know the customer. They try to provide very quick, efficient service…you know, they care. They will ask about customers’ children, especially with school starting they always try to be engaged in all their lives. I have several staff members that have been with me since we opened which I think is impressive in a fast service industry. I try to make it an enjoyable place to work and I think they enjoy working here,” she said, referencing several baristas, adding there’s very few who have been with her less than six months. When she began working, she didn’t know what a latte was and didn’t drink coffee, “but it has been great, I love working here,” she said, happily. “We put people first,” Novosel said.